After the fall of France in May 1940, the British Expeditionary Force was miraculously evacuated from Dunkirk. Britain now stood alone to face Hitler’s inevitable invasion attempt. For the German army to land across the channel, Hitler needed mastery of the skies—the Royal Air Force would have to be broken. So every day throughout the summer, German bombers pounded the RAF air bases in the southern counties. 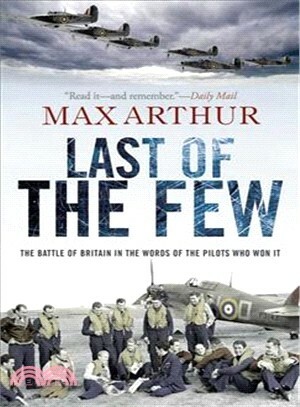 Greatly outnumbered by the Luftwaffe, the pilots of RAF Fighter Command scrambled as many as five times a day, and civilians watched skies crisscrossed with the contrails from the constant dogfights between Spitfires and Me-109s. Britain’s very freedom depended on the outcome of that summer’s battle: Its air defenses were badly battered and nearly broken, but against all odds, “The Few,” as they came to be known, bought Britain’s freedom—many with their lives. More than a fifth of the British and Allied pilots died during the Battle of Britain. These are the personal accounts of the pilots who fought and survived that battle. Their stories are as riveting, as vivid, and as poignant as they were seventy years ago. We will not see their like again.